WUNC in Chapel Hill and WRQM in Rocky Mount both transmit with digital signals that can be received with HD Radios. Signals from these transmitters can be heard on both older analog receivers and newer digital HD Radios. In addition to clearer digital signals, HD allows stations the option to broadcast a discrete, second set of programs on what is called HD2. These radio broadcasts can only be received with a HD Radio. In the summer of 2016, WUNC began a HD2 service called WUNC Music. It is transmitted by WUNC HD2 from the Chatham County based transmitter. WUNC Music is streamed online here on our website and on WUNC's apps. HD Radios are available from stores such as Best Buy and Target as well as many online stores such as Amazon. Radios are also available from the offical HD Radio site. 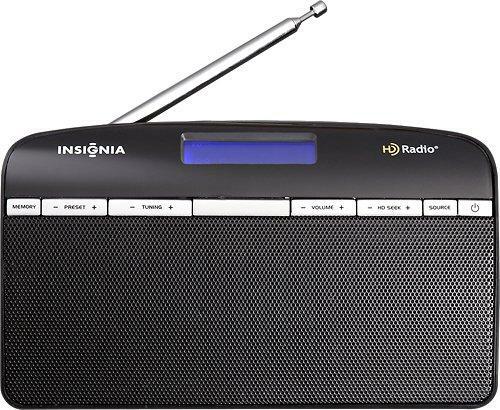 The Insignia Tabletop HD Radio is an example of an inexpensive HD Radio. It's available from Amazon and many other retailers. Q: Will I need a new radio to hear HD stations? A: To pick-up the new digital broadcasts, Yes. However, older radios will continue to receive the main "analog" signal as they always have. Q: What is the cost of a HD radio? A: HD radios have become more afforable in recent years with prices starting in the $50 range. Many new cars come with HD radios installed. Q: Will HD Radio stations carry different programming? Q: Why do I get drop-outs or silences on the HD2 Services? A: Listeners on the fringe of the transmission area may experience drop-outs if the signal falls below a critical level. Unlike analog signals that fade out or become full of static at long distances, HD signals simply go silent when the signal becomes too weak.